ShrinkTheWeb How Do I Upgrade My Account? NOTE: This guide will walk you through upgrading. For details on our pricing model, please click here. Step 1: Login to your account and click the Upgrade tab. Step 2: Select your account level. To see and compare account level features, click the "Compare Options" link or mouse-over the account level you are interested in. Step 3: Select desired PRO Features. Simply select the PRO features you want by clicking the option and confirm that the corresponding check box is checked. For details on what each feature offers mouse-over the feature you are interested in. If you change your mind simply click the feature again and confirm that the corresponding check box is empty. 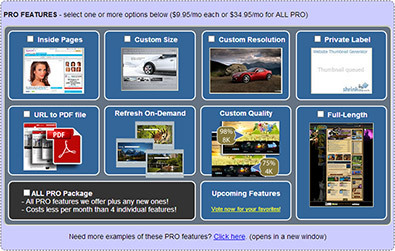 If you want all the PRO features simply click the "ALL PRO Package" option at the bottom right of the "PRO FEATURES" section. Step 4: Upgrade your monthly limits. Based on your usage, you may need to increase your monthly "BANDWIDTH" or "NEW REQUESTS" Allowances. There is no need to do this initially, we will notify you as you approach your limits. Upgrade your monthly "BANDWIDTH" allowance by entering the desired quantity in the provided field. "BANDWIDTH" is upgraded in units of 1GB. Monthly "NEW REQUESTS" are sold in blocks of 5000. Upgrade your monthly allowance by entering the desired quantity of blocks in the provided field. This is a recurring upgrade it increases your total monthly limits and are reset monthly. Click the "ORDER NOW" button on the bottom of the order page and choose your payment method. Once you have completed the order process your upgrades are immediately applied.